This article is about the 1974 film. For the 1993 film, see Godzilla vs. Mechagodzilla II. For the 2002 film, see Godzilla Against Mechagodzilla. Godzilla vs. Mechagodzilla (ゴジラ対メカゴジラ, Gojira Tai Mekagojira) is a 1974 Japanese science fiction kaiju film featuring Godzilla, produced and distributed by Toho. The film is directed by Jun Fukuda, with special effects by Teruyoshi Nakano and stars Masaaki Daimon, Kazuya Aoyama, Gorō Mutsumi, and Akihiko Hirata, with Isao Zushi as Godzilla, Kazunari Mori as Mechagodzilla, and Satoru Kuzumi as Anguirus and King Caesar. It is the 14th film of the Godzilla franchise and Shōwa series. The film was released in Japan on March 21, 1974 and received a very limited theatrical release in the United States in early 1977 by Cinema Shares as Godzilla vs. The Bionic Monster. Early in its release, the film's title was changed to Godzilla vs. The Cosmic Monster. Strange events are taking place in Okinawa. An Azumi priestess has a terrifying vision of a city being destroyed by a giant monster. A type of metal not found on earth is discovered in a cave by a spelunker, Masahiko Shimizu, who takes it to Professor Miyajima for examination. An excavation led by Masahiko's brother Keisuke accidentally uncovers a chamber filled with ancient artifacts and a mural bearing an ominous prophecy: "When a black mountain appears above the clouds, a huge monster will arise and try to destroy the world; but then, when the red moon sets and the sun rises in the west, two more shall appear to save humanity." Keisuke is joined by archaeologist Saeko Kaneshiro, who translates the prophecy and takes one of the artefacts, bearing the likeness of the legendary monster King Caesar, to study. Two men stalk them, one who speaks to them and claims to be a reporter interested in the story, the other of whom attempts to steal the statue from them but fails and flees. Before long, the first sign appears in the form of a black cloud that looks like a mountain. Godzilla (or so it seems) emerges from Mount Fuji and begins a destructive rampage, despite the fact that it has become tolerant of humans within the last few years. Anguirus, usually Godzilla's ally, confronts it only to be nearly killed and forced to retreat, but not before inflicting a wound that exposes something shiny and metallic beneath Godzilla's skin. Keisuke arrives shortly after to make sure that his brother and the professor are out of harm's way and discovers another sample of the strange metal. Godzilla's rampage continues, at a refinery, until another Godzilla emerges and begins to battle it. During the fight, the challenger is revealed to be the true Godzilla, while the other turns out to be Mechagodzilla, a massive robot armed with advanced weaponry in pseudo disguise as Godzilla. After MechaGodzilla's disguise is intentionally burnt off, the battle resumes. The real Godzilla is severely wounded but inflicts some damage on the machine; both monsters retreat hastily. 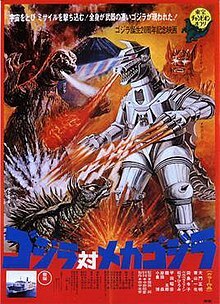 Miyajima hypothesizes, based on MechaGodzilla's advanced technology and composition of unearthly metals, that the robot is an alien super weapon. Keisuke and Saeko take the statue of King Caesar back to the temple by cruise ship, but are confronted by the thief once again. During the fight, the stranger's head is wounded and the skin on half of his face melts away to reveal an apelike visage. The intruder attempts to kill Keisuke and nearly succeeds, but a bullet from an unseen gunman kills him and propels him overboard. Keisuke and Saeko catch a brief glimpse of the "reporter" once again. Meanwhile, Godzilla arrives on Monster Island during a thunderstorm and is struck by lightning multiple times, seemingly reinvigorated. Masahiko, Miyajima and his daughter Ikuko go to explore the cave where the metal was first found and are captured by the apelike aliens of the Third Planet from the Black Hole, who plan to use MechaGodzilla to conquer Earth. Their leader, Kuronuma, forces Miyajima to repair the robot. While Saeko checks into a hotel and guards the statue, Keisuke goes to meet his brother at the caves and instead encounters the reporter, who explains that his name is Nanbara and he is actually an Interpol agent who has been tracking the aliens and believed Keisuke to be connected to them. Nanbara and Keisuke infiltrate the alien base and free the prisoners. The team then splits up, with Miyajima, Nanbara, and Masahiko returning to the alien base and deliberately getting recaptured by Kuronuma, while Keisuke and Ikuko pick up Saeko and the statue from the hotel. In the early hours of the morning, a lunar eclipse results in a red moon and a mirage creates the illusion of the sun rising in the west. The team realizes that the time has come to awaken King Caesar. They meet with the Azumi priestess and her grandfather, and place the statue on a platform in the temple, revealing the monster's resting place. However, just then, Kuronuma dispatches MechaGodzilla. The priestess sings a hymn that awakens King Caesar, and Godzilla appears shortly afterwards. King Caesar and Godzilla fight together, but they are no match for MechaGodzilla's vast array of weapons. Eventually, Godzilla uses the electricity stored in its body from the lightning to create a magnetic field that ensnares the robot, then removes its head, shutting off its controls. While the mortified aliens are distracted, Nanbara and the others free themselves, kill their captors, and sabotage the base, fleeing as it burns and collapses on itself. With the enemy defeated, Godzilla heads out to sea and King Caesar returns to its resting place while the heroes rejoice. Cinema Shares theatrical posters for the 1977 U.S release of the film. The film changed titled while in theatres from Godzilla vs The Bionic Monster to Godzilla vs The Cosmic Monster. Godzilla vs. Mechagodzilla was released in Japan on March 21, 1974 where it was distributed by Toho. The film made slightly more money than Godzilla Vs. Megalon, but was still not making as big as a box office profit as the other films in the Godzilla series had in the early 1960s. The film was followed up with a direct sequel in 1975 titled Terror of Mechagodzilla. The film was released in the United States in March 1977. It was released by Cinema Shares in the United States under the title Godzilla vs. the Bionic Monster where the film was shown predominantly at Saturday "kiddie" matinees. The Cinema Shares theatrical version deleted four minutes of credits, profanity and blood-letting from the film. Universal Television threatened to sue Cinema Shares over the use of the name "Bionic" in the films title as they owned the rights to The Six Million Dollar Man and The Bionic Woman series. The film title was quickly changed to Godzilla vs. The Cosmic Monster, which was also used for the 1977 UK theatrical release. In 1988, New World Video restored the film on video, using a complete and unedited print titled Godzilla vs. Mechagodzilla. In 2004, TriStar released the film on DVD as Godzilla vs. Mechagodzilla with both English and Japanese audio included. In a contemporary review in the Monthly Film Bulletin, Tony Rayns stated that at this point in the Godzilla series, there was no way the film "could have been anything other than formulary, but it could clearly have been much less shambling than it is." Rayns noted that Shinichi Sekizawa's story was "for once, quite ambitious" while noting that the film's "'mythic' elements are never coherent or impressive enough to match the array of alien technology, and the script seems to forget all about fulfilling its own prophecies as it hurries towards the regulation free-style wrestling climax." From retrospective reviews, Stuart Galbraith IV discussed the film in his book on Japanese genre films. Galbraith described the film as a "complete mess", finding that the aliens in the film were a rip off of Planet of the Apes and that the film had poor effects work and "equally poor direction of Jun Fukuda." Galbraith opined that the film was "an improvement over Godzilla vs. Megalon, but that's not saying much." Among the positive attributes, Galbraith noted that Masaru Sato's score was interesting and series veterans Akihiko Hirata, Hiroshi Koizumi and Kenji Sahara "make welcome appearances." In Phil Hardy's book Science Fiction (1984), a review stated that "the final fight is suitably impressive although the tongue-in-cheek reference to Leone slows the action down too much." ^ a b c d e f g Galbraith IV 1994, p. 352. ^ Edelson, Edward (1980). Great animals of the movies. Doubleday. p. 85. By the late 1970s, Godzilla films settled down to a comfortable formula. Toho was making two films a year. Each cost in the neighborhood of $1.2 million and could be counted on to earn about $20 million. ^ a b c Ryfle 1998, p. 361. ^ a b c Galbraith IV 1994, p. 217. ^ Galbraith IV 1994, p. 220. ^ a b c d e Galbraith IV 1994, p. 219. ^ a b Kalat 2007, p. 137. ^ "Godzilla vs. Mechagodzilla (1974) - Jun Fukuda: Releases". AllMovie. Retrieved October 12, 2015. ^ a b Rayns, Tony (1977). "Gojira Tai Mekagojira (Godzilla vs. the Bionic Monster)". Monthly Film Bulletin. London: British Film Institute. 44 (516): 122. ^ Hardy 1984, p. 319. Galbraith IV, Stuart (1994). Japanese Science Fiction, Fantasy and Horror Films. McFarland. ISBN 0-89950-853-7. Hardy, Phil, ed. (1984). Science Fiction. New York : Morrow. ISBN 0-688-00842-9. Kalat, David (2007). A Critical History and Filmography of Toho's Godzilla Series. McFarland. ISBN 0786430990. "ゴジラ対メカゴジラ (Gojira tai MekaGojira)" (in Japanese). Japanese Movie Database. Retrieved 2007-07-18.